PlayStation is becoming a really great platform for indie developers. It’s a new platform that allows these developers to reach new audiences for games that might have only had limited success on other platforms. The PS3, PS4, and the PS Vita have lately been seeing a steady flow of indie titles, many of which first saw life on the PC. Though there are those gamers who have been complaining recently about how PS4 and PS Vita are getting too many indie titles and not enough AAA love, I on the other hand welcome all these new games as I’m a big fan of what some of these indie developers can come up with. I’ve played a good chunk of really fun and unique indie games already on both PS4 and PS Vita and find that gameplay on these are just as good or better then some AAA titles. 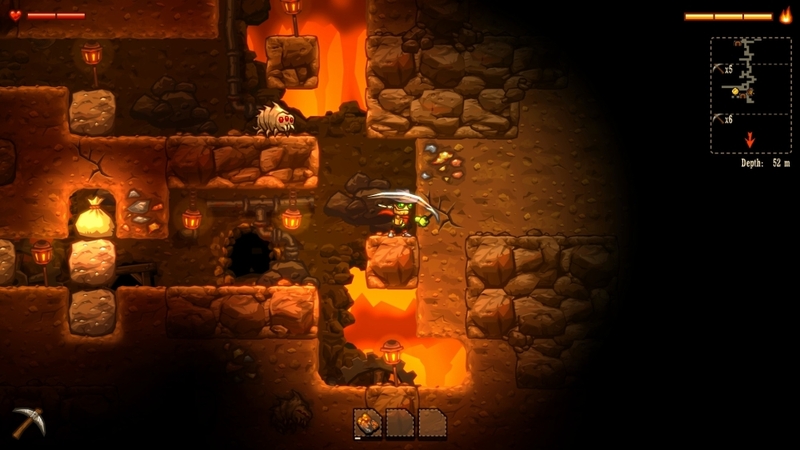 For instance, the latest game I’ve been checking out is SteamWorld Dig by developer Image & Form. What drew me to this game at first was the fact that it looked like a retro platformer with shades of Spelunky with a bit of Dig Dug thrown in. 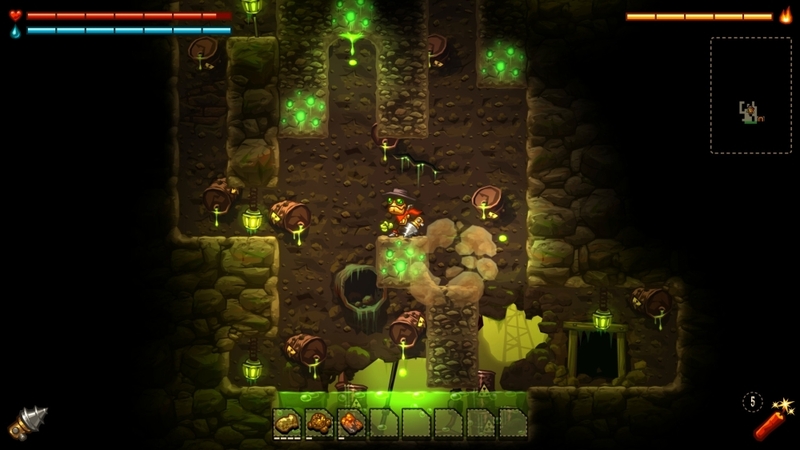 You see, SteamWorld Dig is a mining platform adventure game, which basically means that there is a lot of digging involved as well as more traditional platforming elements such as exploration and battling enemies. Most of the review here is based on the PS4 version, but I’ve also played the PS Vita version one too and they are both basically the same except that the PS Vita version allows for some touch controls, mainly for the menus. The story isn’t too complex here and the devs made it easy to follow. You play as Rusty, a robot who has come to discover that his uncle has recently perished in a mining accident. Because of this, you are left as the sole beneficiary of his mine, located underneath the town of Tumbleton. It’s your job to keep the mine running by mining for minerals and ores while also helping the town of Tumbletomn flourish and grow. You soon discover that there’s a deeper mystery connected to the mines and your uncle and it’s up to you to discover what that was. 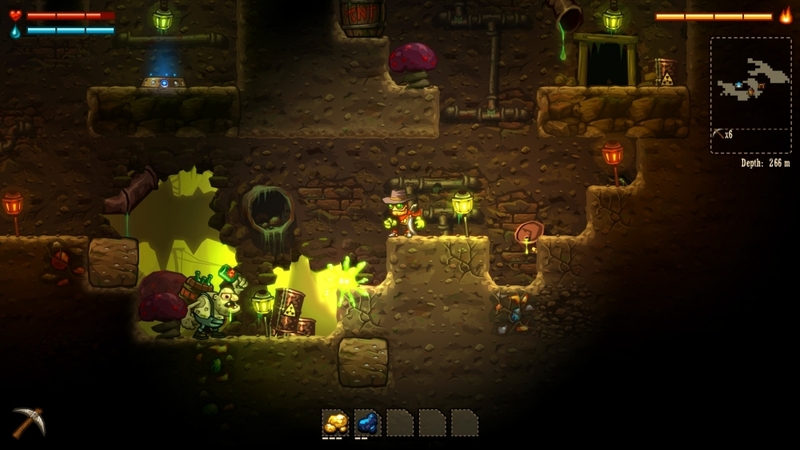 SteamWorld Dig is actually quite an interesting game to play. It’s mainly a digging game where you start off in this huge area and must dig your way through it looking for valuable minerals and ores. You are literally digging your own world below the surface creating tunnels and platforms to stand on. All you’ll have at first is your trusty pickaxe that can be upgraded to dig faster and through harder materials. 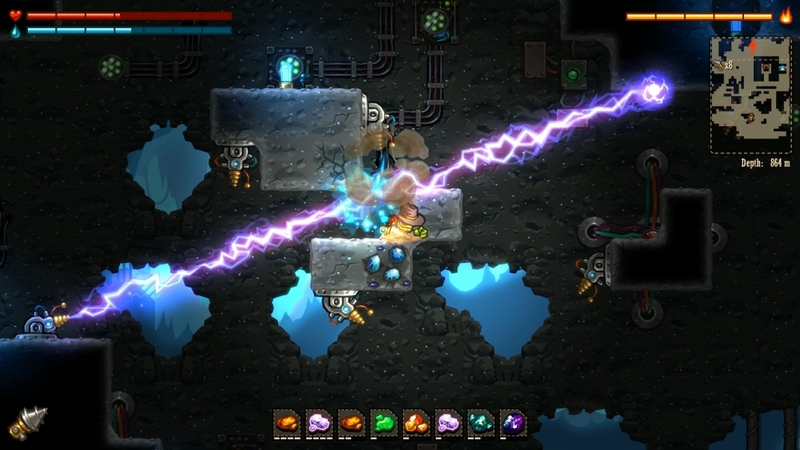 As you progress, you’ll also receive a drill that dig through solid rock, explosives to destroy larger areas, and other upgrades to help mining much easier. Since this is a 2D game, your digging is limited to either horizontal or vertical square sections. Not only that, there is gravity involved so you can’t go digging in any direction you want, only in the direction gravity allows. What that means is that despite what might seem like a simple game, there is real strategy and planning involved when it comes to how you want to dig your tunnels. Dig haphazardly and you may find that you can’t reach certain spots anymore or will have to find an alternative route. While digging, you’ll also come across areas where enemies reside that once laid dormant until you came along and disturbed their slumber. This is where a portion of the platforming elements kick in and you’ll have to find ways to vanquish your foes. You can either use your trusty pickaxe, drill, or a variety of explosives to get the job done. The enemies aren’t terribly hard to beat especially after your upgrades, you just have to keep an eye on your health and make sure you don’t die. Speaking of death, if you do happen to die, you’ll be resurrected exactly at the point where you left off. However, you’ll start way back at the surface in the town of Tumbleton and all your possessions at the time get bundled into a bag and left exactly where you croaked. You’ll have to make your way back to where you died to gather all your belongings. Although you get your stuff back and continue where you left off, I would still suggest not dying as you do incur a monetary penalty for each death. The penalty is 50% of your current loot which is quite steep so you’ll want to stay away from death or you may find that you won’t have enough to fully upgrade Rusty. As fun as the mining portion of the game is, the ultimate goal is to discover the secrets that lay below Tumbleton and what your uncle had discovered before his death. I won’t spoil that part of the story for you. What’s awesome about the game though is that when you do finally beat the game, you can replay it all over again and it will not be the same experience twice. The world is randomly generated during each playthrough meaning it’ll be a unique experience each time, though the storyline and general outcome is the same. The randomly generated levels means you can play each of your playthroughs a different way if you like. Graphically, it’s an impressive looking game despite being in 2D. Yes it might not be what you’d expect in terms of “next gen” gaming graphics but for what the game is, it looks pretty good. The PS4 version of the game looks very sharp and detailed with no jaggies in sight. It also makes use of some really good looking real time lighting effects. On the PS Vita, the graphics here too look incredibly sharp and as good as the PS4 version. Sound wise, there is a decent background soundtrack and each little action has its own sound effect. The characters too even have their own sounds though they speak in a nonsensical form of gibberish. Overall, both graphics and sound add to the over all atmosphere of the game and really immerses you in it. The graphics work very well for the type of game it is and really keeps the the focus of your attention on the gameplay. There are those who complain about the number of indie games popping up on the PlayStation, but I’m not one of them. I actually really enjoy playing many of these indie games that are popping up on the PlayStation even if they’ve been out before on other platforms. For me, I never even knew about some of these games until they showed up on PSN so for the developers, this is great because a whole new audience is able to enjoy their creations. I can honestly say that SteamWorld Dig is loads of fun, both on the PS4 and on the PS Vita. The gameplay is solid and harkens back to some really great games of yore while also bringing something new and unique to the table. 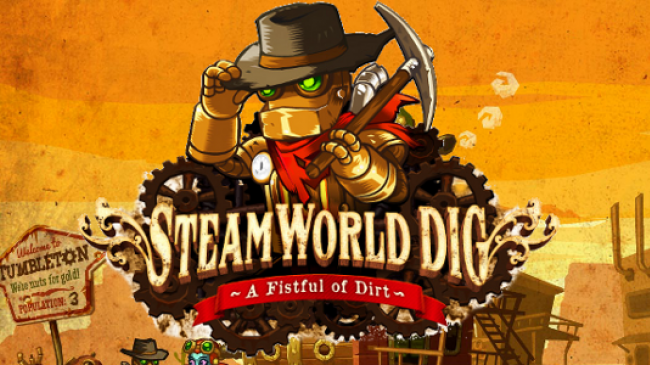 My favorite thing about the game though is the fact that the game changes each time you play so in essence, you can play SteamWorld Dig differently each time. I for one love to explore every nook and cranny though I can see myself trying to speed run this game on my next play through. 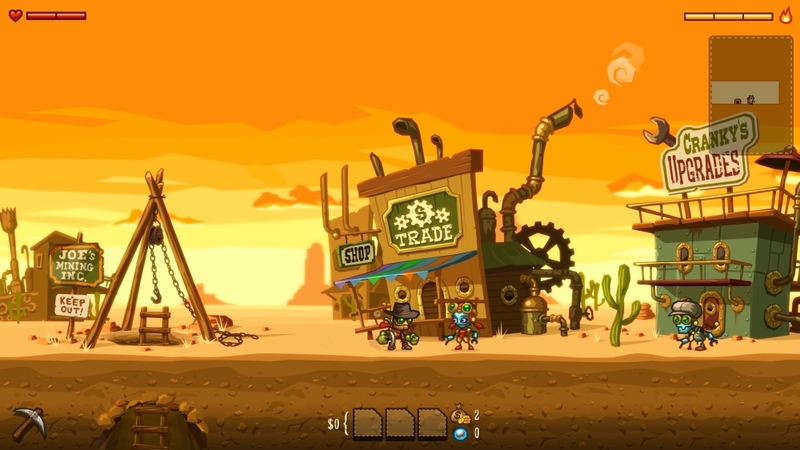 SteamWorld Dig allows you that freedom of playing it your way. If you haven’t played this on any other platforms, I highly recommend picking up this title for the PlayStation as not only will you get the PS4 version of the game, you also get the PS Vita version of the game too if you own both. This way, you can play on your giant HDTV at home and then play it on the go with your PS Vita. Disclaimer: Developer Image & Form sent me the PSN download code for this game to review.